Do you have a child who is crazy about Greek mythology? Maybe they became a fan of mythology after reading The Lightning Thief or during a recent history class at school. Take advantage of this newfound interest and introduce them to Ancient Greece — take a virtual field trip, study the stars and explore the cultural ideals and customs. The Greek alphabet is more than 2500 years old and still used today. It consists of 24 letters/symbols, each with its own name. The Ancient Greeks were the first to add vowels to their written language. Some of the letters easily translate into the sounds we are familiar with in our English alphabet while other letters from the English alphabet are not found in the Greek language (for example, there is no letter J in the Greek alphabet). Kids can visit EDSITEment to learn all the letters in the Greek alphabet, along with their names. You might try to write a few of your own Greek words. Kids can also learn how to pronounce the various letters by using Lesson 1 at the site I Learn Greek. The Ancient Greeks enjoyed competitions and were the ones who created the first Olympic Games. When the games first began, each city in Greece would send a team to compete. Nothing would stop the Greeks from attending; if a city was at war during the games, the war was halted so the city could be represented at the games. Kids will enjoy learning about how Greek children would be prepared for the games – each of the five main cities in Ancient Greece had their own training and preparation routine, some were very harsh while others prepared strong and educated kids. Wouldn’t it be wonderful to visit Greece and see some of the ancient landmarks like the Parthenon? The next best thing is to take a virtual trip to the country! Explore some of the stone temples and ancient landmarks of Greece through KIDS DISCOVER’s issue on Ancient Greece. Another wonderful website that allows kids to explore Ancient Greece is the BBC’s Primary History – Ancient Greece. You can learn about Greek theater, the arts, home life and what it was like to be a child during ancient times. 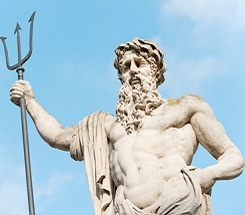 Much of ancient Greek culture focused on the belief in various gods and heroes. The Greeks believed that the gods watched over them and offered them blessings in various areas. For example, Athena is the goddess of wisdom and the Greeks would turn to her for advice. All of the gods and goddesses are related and each has their own area of expertise. If your kids aren’t familiar with all the Greek gods and goddesses, Rick Riordian (author of the Lightning Thief series) has a directory of all the main gods/goddesses. Click on the name of the god or goddess and the reader will see a photo, description and fun facts about each. The ancient Greeks contributed many scientific ideas and inventions to the modern world. They estimated the size of the earth, used astronomy to date their calendar and discovered the sun was the center of our solar system. They also contributed to our nighttime sky. Many of the constellations in the Northern Hemisphere are named by the ancient Greeks. Take a walk one evening and try to locate some of the more famous constellations – you might look for Orion or Pegasus. Use this star chart and sky map from Kids Astronomy for help locating which constellations appear in the evening sky.